This entry was posted in Alcohol, Success Story on January 10, 2015 by ATMC Team. The embarrassment, guilt and shame were just too much to bear! 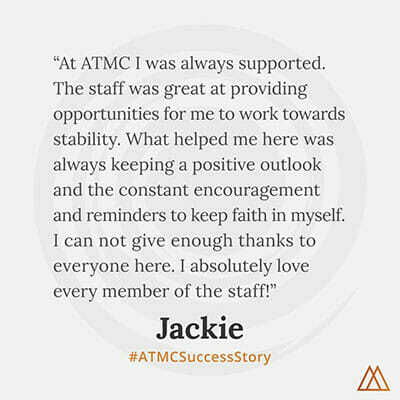 I needed help … ATMC really showed me how to live a better and healthier life and for that I am truly grateful! My name is Matt. I’m 46 years old and I had abused alcohol most of my adult life. And just like most of us drinkers I started my drinking career with beer in my early twenties. I was raised and involved in a successful family construction business since my teenage years. There was always a reason or need to go out and entertain customers and clients. In my late twenties I migrated from moderate to heavy beer drinking on to the harder stuff like vodka and whiskey. By my early thirties and having gone thru a divorce, lost my mother to cancer and selling the family business, I had turned into a 7 day a week drinker. Still I was a totally functioning individual and ignored the concerns of family members and friends as I continued my graveyard spiral dive. I was oblivious to the condition I was in and the person I had become. This pattern continued till October of 2014 when my body had had enough abuse and totally rejected alcohol altogether. Wow! I couldn’t believe what was happening. What a disappointment I thought. That wasn’t the worst part. The thing that really was an eye opener was that at that same time I realized that in the previous 7 years of my drinking and extreme manic behavior, I had spent most all of my fortune and married a girlfriend that I was in and out with for the same 7 years. All of this was enough to send me into a mental overload and that’s what happened. I shut down totally! Sleep deprived and like a little puppy dog with my tail tucked between my legs, scared and afraid. I had to sell my home and assets to payoff debts. My retirement plans literally had been canceled at the age of 46. What a scary thought! Starting all over at this age with 2 kids still in college. I quit answering the phone. Returning phone calls was out of the question I alienated myself from close friends and family, even my kids. The embarrassment, guilt and shame were just too much to bear! I needed help! Next I checked into a 12 step alcohol rehabilitation program for three weeks. I still could not focus or concentrate afterwards. Then I checked into a mental hospital for 8 days and all they did is put me on psyche medications. I still needed help! Out of desperation I attended 2 weeks of intensive out patient mental therapy at another clinic. Still unable to concentrate or focus on things that were second nature to me, I still struggled with the simplest tasks. Too paranoid that I wasn’t doing a good job or taking too long, too overwhelmed with all the other 15 things that I had put off while trying the 3 previous treatment options. I was a mess! I still could not focus or function. I needed help, something different. That’s when my father put his foot down and said this is the only thing left to try! ATMC- ATMC in Sedona, Arizona. They specialized in treating people like me. Bipolar, mania, insomnia just to name few conditions. But most importantly, they treated it with all natural supplements and no medications whatsoever. Matter of fact they used all natural treatment to taper individuals off of street drugs, as well as prescription medications. I was strongly opposed to the idea of holistic style of treatment. But lets be real I was out of options. I needed help! My father hired an interventionist to convince me to make the trip to Sedona where ATMC’s facility was located. I remember arriving on a Saturday afternoon and being greeted by a friendly, and professional staff. A couple hours later they were serving me wonderful gluten and sugar free food. Still a skeptic all the first week of the program offered at ATMC, I went for walks with each and every staff member and told them all that my problems were too big and that I probably would not stay. That I was wasting their time and mine. I had real big problems such as horrible financial obligations; marital problems and I had no idea what I was going to do to make a living. I truly felt hopeless! But again I was out of options. I decided to listen to my Care Manager and immediate family and give the program a chance. By the end of the second week I could tell that my mood and attitude had taken a turn for the better. I still didn’t want to believe it but Juan my care manager and my father kept insisting that I had improved. This gave me hope! By the end of the third week my thought process was actually starting to work again. I could actually read a paragraph of the mood cure book and comprehend what I had just read unlike when I arrived. This was very encouraging to me! Next, I started reaching out to old friends that I had ignored the last five or six months. I started corresponding with my son and daughter. They all could tell a real difference in me and my outlook on life. This was good news for me. I really was making improvement! The staff at ATMC kept encouraging me that I was on the right track. Continuing to council me in the right direction, both spiritually and mentally. In turn I started to reach out and help my fellow residents with whatever their needs were. Hugs and words of encouragement to others seemed to be natural to me! By week 5 I felt like my body and mind were back running on all 8 cylinders. I had mental clarity that I hadn’t had in years. I felt great! And I was completely off of Depakote and only 50 mgs of Trazadone. Things were looking up! I felt ready to leave and start my new life, medication and alcohol free. However I wanted to be completely off of all medications before I left so I continued the program another 3 weeks. Exercise, sauna, spiritual therapy and eating a healthy diet were all very important factors for my success. I really can’t say enough for my Care Manager Juan! He was very professional and accommodating to me every step of my journey. Likewise for all the staff at ATMC! I would encourage anyone that has addictions to alcohol, drugs, street or prescription to consider ATMC to regain their health, both physically and mentally and become medication free. ATMC really showed me how to live a better and healthier life and for that I am truly grateful!